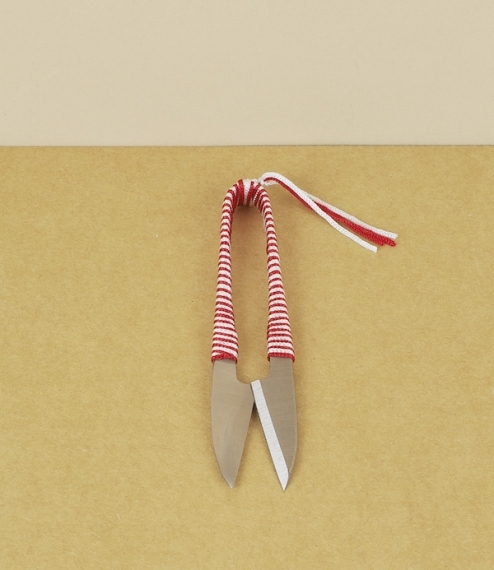 Small Japanese scissors wrapped in red and white silk cord. The scissors are forged from a single billet, the blades and centre being beaten flat at right angles, then the bar bent, set, and carefully tempered at the elbow to form a spring. These small scissors are suitable for delicate and precise work with paper or fabric, for embroidery work, unpicking seams, even trimming house plants. Used between forefinger and thumb. Carbon steel, 35mm blade.